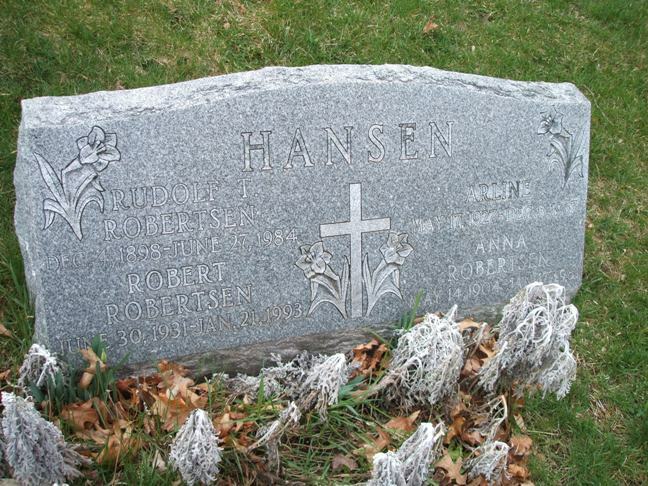 Grave (177-574-2) of Robert S. Hansen (1926-1994), son of Ole Kornelius Skartveit Hansen, from Tysnes, Norway, and Inga Thomson. Ole came to the States in 1906, while his future wife arrived 2 years later, cf. the 1920 US census. I haven't found out exactly where in Norway she came from, though. Grave (166/176-146) of Rudolf Robertsen (1898-1984), his wife Anna, née Johannessen (1904-1981) and their children Robert Robertsen (1931-1993) and Arline Hansen (1927-1967), the latter the first wife of Robert Hansen mentioned above. 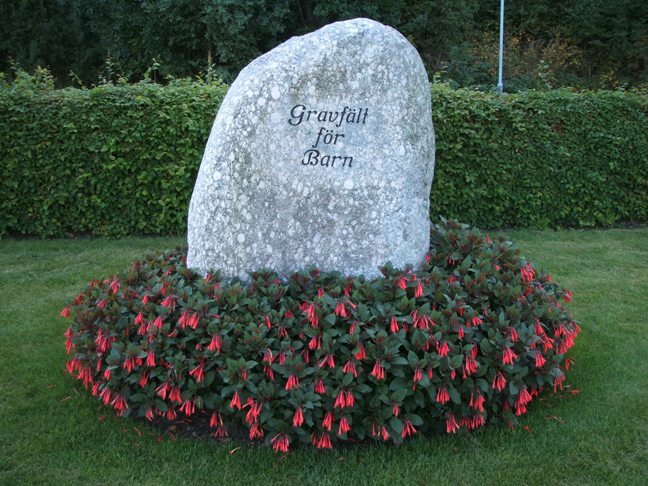 Rudolf, my wife's great-uncle, was born at Lillehavn in Spangereid (today Lindesnes municipality) as the fourth child of Tobias and Andrea Robertsen, while Anna was born in Farsund as the daughter of Johan Julius Johannessen, Farsund and Anna Bendiksdatter, Stavanger. 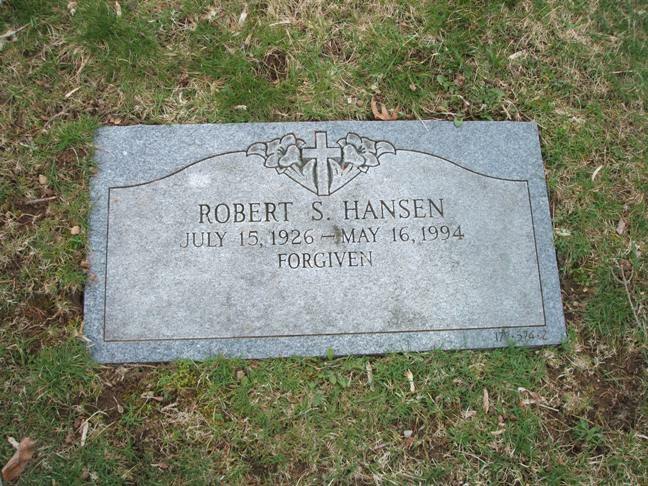 See the Robertsen genealogy for more details. 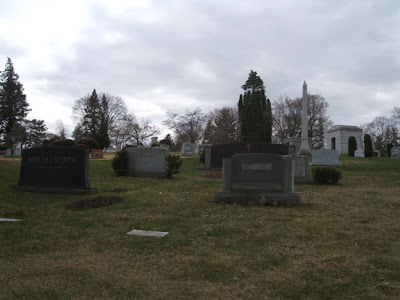 During my last trip to the United States in April 2009 my wife and I visited family on both sides - some of my wife's Robertsen relatives in Brooklyn, New York as well as my Hoelseth and Ekeli relatives in Maryland. 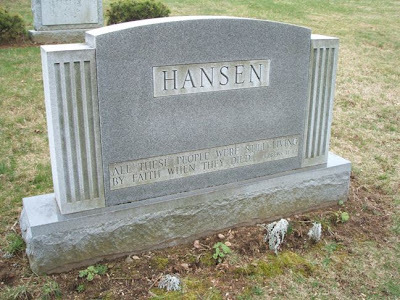 Before heading for Maryland after having spent a few days in New York City, we decided to make a detour to Kensico Cemetery in Valhalla, Westchester County in New York, as I was working hard to finish the genealogy of the Robertsen family of Lillehavn, Lindesnes and wanted photos of the Robertsen grave to be included in the booklet. Unfortunately the photos didn't turn out so well in black-white and had to be taken out before the booklet went to print. But the photos were good enough to be published in this blog instead. We visited the cemetery on a windy and cold April day, so we didn't spend too much time there. 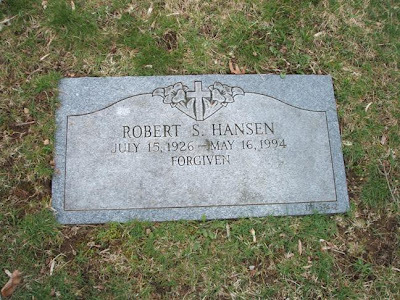 We found the Robertsen and Hansen graves after receiving directions from the cemetery office and then set off for Maryland. The official website reveals that the cemetery is well worth visiting and deserves a longer stay than we had the opportunity for. 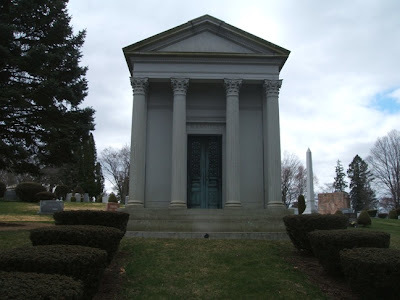 There are many well-known people buried there, including several actors, composers and politicians as well as the Manhattan socialite Thomas F. Manville, Jr. (see photo no. 2 above and Findagrave.com) and Princess Irina Wolkonsky (1903-1969), daughter of the musician Sergei Rachmaninoff (1873-1943; see Kensico.org and Findagrave.com). 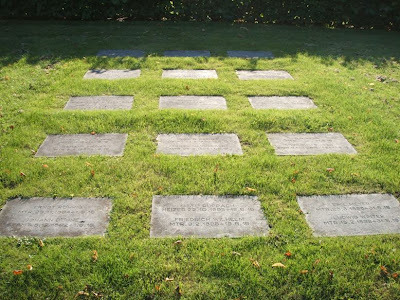 Another list of "Notable burials" can be found at Wikipedia. 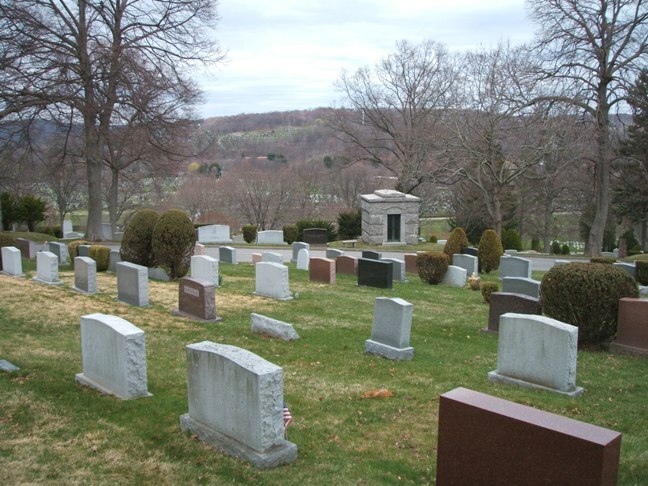 According to the official website, the Kensico cemetery was founded in 1889 when a 250-acre tract of farmland and hills was bought. The cemetery was expanded to 600 acres in 1905, but already 7 years later it was reduced to 412 acres when 130 acres were sold to Gate of Heaven Cemetery (which I think you can see in the background on the first photo above) in addition to 8 acres acquisited by the City of New York. 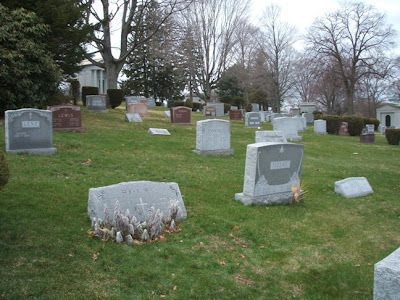 Finding reasonably priced land near the railway was the key factor in the 1880s when the New York City cemeteries were becoming full. 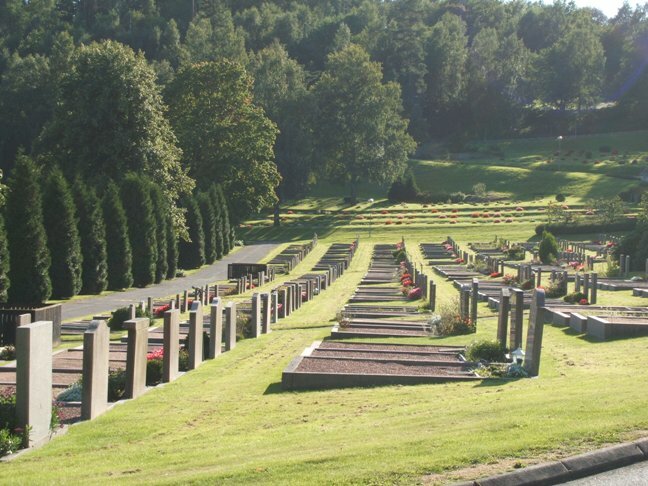 This means that you can get to Valhalla by train and then walk to the cemetery, which is only a few blocks away. 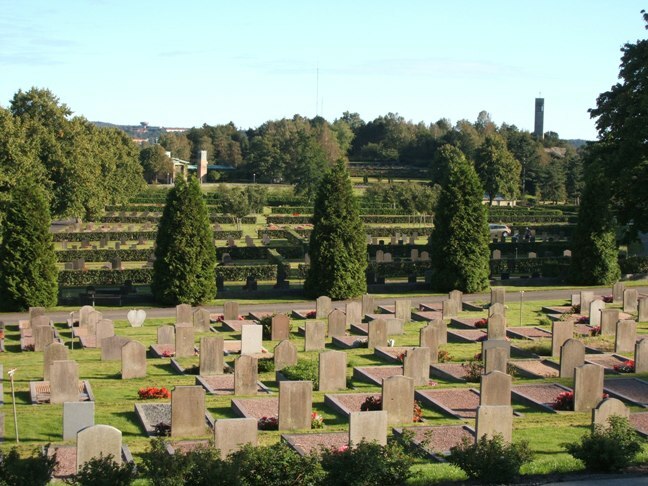 But remember that the cemetery is large and that you will be easily tired if you want to spend a lot of time there. 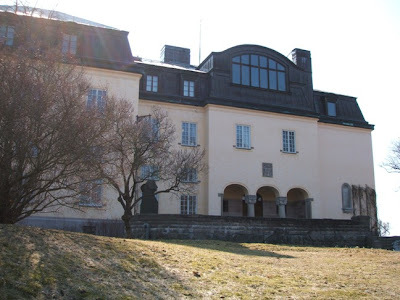 Postscript 27 February 2012: It turns out that Thomas F. Manville (1894-1967) mentioned above was the first cousin of Countess Estelle Bernadotte af Wisborg (1904-1984), née Manville, who married Count Folke Bernadotte af Wisborg (1895-1948), son of Prince Oscar Bernadotte (1859-1953) and Princess Ebba Bernadotte, née Munck af Fulkila (1858-1946), in 1928. Thomas F. Manville's Jr. father Thomas F. Manville was the brother of Hiram Thomas Manville, Estelle's father, cf. Wisconsinhistory.org. 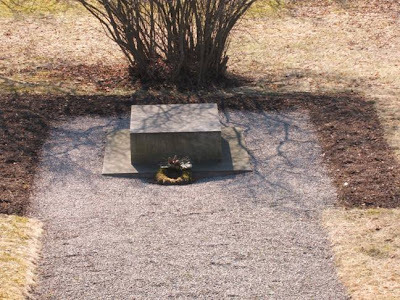 When I visited the Kensico Cemetery back in 2009 I focused on my wife's Robertsen family and never thought about the Manville-Bernadotte connection, not even when I made the blog article... The name Estelle seems to have been a source of inspiration to Crown Princess Victoria when the name of her daughter Princess Estelle was decided. Updated on Monday 27 February 2012 at 19.45 (postscript added). 2011 seems to become the royal wedding year! We have already witnessed the celebrations of the union between the Duke and the then (prior to the wedding) Kate Middleton on 29 May 2011. In early July 2011 the reigning Prince of Monaco, Prince Albert, is to wed his long-time girl-friend Charlène Wittstock, while the head of the Royal House of Prussia, Prince Georg Friedrich, is to marry Princess Sophie of Isenburg at the end of August. Today, at this auspicious gathering, I would like to make a short announcement to all the people of the 20 Dzongkhags. As King, it is now time for me to marry. After much thought I have decided that the wedding shall be later this year. Now, many will have their own idea of what a Queen should be like – that she should be uniquely beautiful, intelligent and graceful. I think with experience and time, one can grow into a dynamic person in any walk of life with the right effort. For the Queen, what is most important is that at all times, as an individual she must be a good human being, and as Queen, she must be unwavering in her commitment to serve the People and Country. As my queen, I have found such a person and her name is Jetsun Pema. While she is young, she is warm and kind in heart and character. These qualities together with the wisdom that will come with age and experience will make her a great servant to the nation. This union does not mean that I am starting my own family. From the very day I received the Dhar Ngay-Nga from the sacred Machhen, the people of the 20 Dzongkhags became my family. Such is the duty and privilege of all Kings of Bhutan. It is through this union, that I shall have a Queen who will support, and work with me, as I serve the People and Country. The wedding will be in accordance with age-old tradition, to seek the blessings of our Guardian Deities. I ask the government not to make any plans for a grand celebration. The happiness of my beloved father and the blessings of our People will give me the greatest joy and happiness. Not sure how to interpret his comment about not starting his own family, but hopefully he meant to say that the couple didn't have any immediate plans for having children. Anyway, the local newspaper Bhutan Observer informs that Jetsun Pema, the future Queen of Bhutan, was born at Thimphu on 4 June 1990 as the daughter of Dhondup Gyaltshen, the grandson of Trashigang Dzongpon Dopola, and Sonam Chuki, who stems from the family of Bumthang Pangtey. Now, I am far from an expert on Bhutan, but as far as I understand it, Dhondup Gyaltshen's grandfather was a Governor of the district of Trashigang, while the Pangteys seem to be a prominent/noble family of the district of Bumthang. The bride-to-be is a commoner, though. She is the 2nd eldest child and has two brothers and two sisters. The 21 years' old Jetsun Pema has received her education from Regent's College in London, the Lawrence School of Sanawar, Himachal Pradesh and St. Joseph's Convent in Kalimpong, both in India as well as secondary schools in Bhutan. According to the Bhutan Observer the future Queen has already started to get her "royal training", as she has been accompanying the Dragon King on royal tours around the country in recent months. NewKerala.com writes that Jetsun Pema is well-versed in Hindi and English, and, as her English teacher at the Lawrence School recalled, she was good in sports, including athletics and basketball. Jetsun Pema's younger sister Serchen Doma is currently a student at the just-mentioned school in Sanawar. According to the Bhutan Times, Jetsun Pema (here spelt Prema for some reason) was not in the parliament building when the engagement was announced, but watched the ceremony on TV at home. Later in the evening, she made her first appearance as the king's fiancée at a dinner to open Mountain Echoes, an annual India-Bhutan literary festival that started on Saturday 21 May under the patronage of the Queen Mother, Ashi Dorji Wangmo Wangchuck. Jigme Khesar Namgyel Wangchuck, 5th Druk Gyalpo of Bhutan, was born on 21 February 1980 as the eldest son of King Jigme Singye Wangchuck by his third wife Queen Tsering Yangdon Wangchuck. The 5th Druk Gyalpo became king on 14 December 2006 on his father's abdication and got crowned on 6 November 2008. The king shares his birthday with the King of Norway, by the way. See The Royal Ark for more details about the Royal Family of Bhutan. The members of the Royal Family shall be the reigning and past Monarchs, their Queens and the Royal Children born of lawful marriage. Is it a correct understanding that "royal children" must be children of a monarch? Jetsun Pema could be described as a "high-born" lady nevertheless, even if she as a non-royal comes into the commoner category. Pema is granddaughter of the legendary Thinley Topgay, popularly called ‘Sey Dophola’ and second eldest child of the five children born to Sonam Choki and Dhondup Gyaltshen. Dhondup Gyaltshen, a pilot for 22 years with Druk Air, is the son of Brigadier Ugen Dorji Tangbi from Tangsibji, Trongsa and Aum Karma Yangzom. Yangzom is the daughter of Trashigang Dzongpon Thinley Topgay. Currently Gyaltshen works with Bahrain Airways. Aum Sonam Choki is the daughter of Thinley Namgyal (of Pangtoe Goemba in Bumthang) and Aum Rinchen (of Chorten Nyinpo-Chumbi at Chumey in Bumthang). In fact she is illegitimate daughter of Prince Namgyel Wangchuck (brother of King Jigme Dorji Wangchuk) and Thinley Namgyal is the half brother of their late majesties, Mayum Phuntsho Choden and Mayum Pema Dechan. See also the websites Bhutan's Royal Family (RAOnline Bhutan) and The Royal Family of Bhutan (2008.bhutan-360.com). The following article was published at the royalty forum Nobiliana.de 6 June 2006 and at the newsgroup alt.talk.royalty on 16 June 2006. This was before my blog was created so I have decided to re-publish the article here, with some minor corrections and additions. «Anne Michelle Lütken, formerly married to Baron Christian de Massy, died in London on 25 November 2001. Josefinesgates klinikk was the popular name of Oslo kommunale kvinneklinikk (Oslo Municipal Women's Clinic). According to VG of 29 November 2001, Anne grew up at Skillebekk in Oslo. 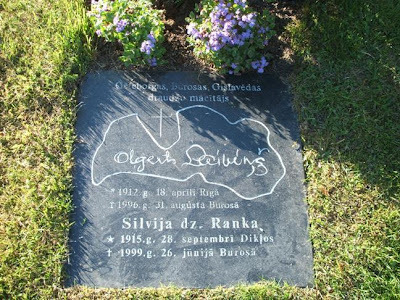 She had a difficult relationship with her father, especially after he left her mother for another woman, and moved out and got her own apartment at Skillebekk only 16 years old. 2 years later she moved to Milan in Italy to study, was discovered by a photographer and started working as a model. She became more interested in partying than studying. At the time she became a model she had already tried amphetamine (speed) and later moved on to cocaine. She met the Swedish tennis player Björn Borg who introduced her to another tennis player, Vitas Gerulaitas. They were an item for about a year. The abuse of cocaine continued. At a night club she met Baron Christian de Massy, son of Princess Antoinette of Monaco and nephew of Prince Rainier III. They married at Ramatuelle, St. Tropez on 11 September 1982. (*) The jetset life continued in Monaco, London, New York and France. - We slept at daytime and partied all night long. 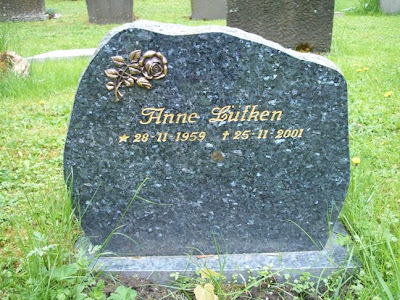 Our life was alcohol, wild parties and shallow friends, Anne Lütken once said in an interview with Se og Hør. According to VG, they moved to New York in an effort to get away from their cocaine addiction. Christian de Massy served as Ambassador of Monaco for a while (can this really be true?) and represented the tiny principality on behalf of the Grimaldis. 2 years earlier she had been charged on indictment for purchase of 7 g cocaine and 3 g amphetamine, but the case was later dropped. She continued to make headlines. 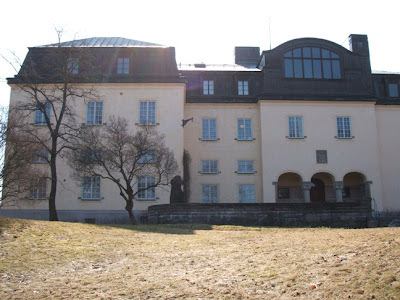 In 1990 she was in company with the Bergen man nicknamed «Hallik-Frank» («Frank the Pimp») when he fired shots against another dubious character, the «torpedo» (debt collector) Espen Lie. In 1999 her boyfriend, the Greek multi-billionaire Constantine Niarchos, died of an overdose of cocaine. 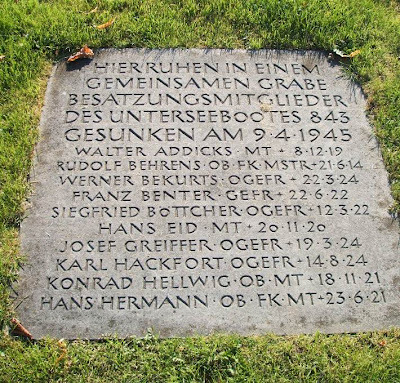 Anne Lütken was in the same apartment when he died. After her friend's death she went public warning young people against the dangers of drugs. She planned to found a charity organisation to help out young girls who «had wandered from the straight and narrow». 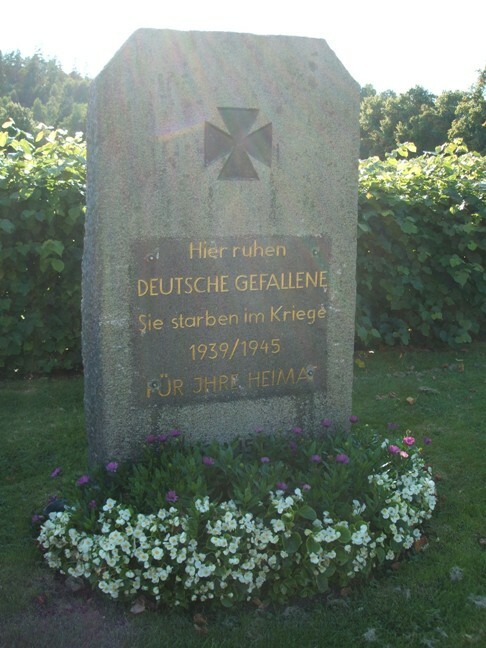 Anne Lütken never got that far. On Sunday 25 November 2001, 3 days before her 42nd birthday, she was found lifeless in her luxury apartment at Phillimore Place in Kensington, London. 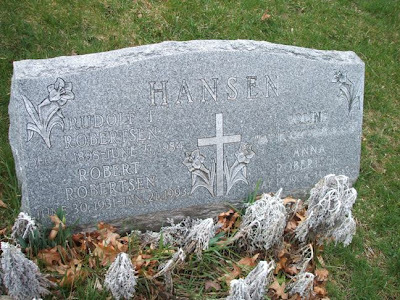 According to her sister-in-law, Anne had got respiratory problems and died in her sleep. A friend attempted to resuscitate her, but to no avail. It shouldn't be too difficult to read between the lines and realize the real cause of death, but the result of the autopsy was as far as I know never published. 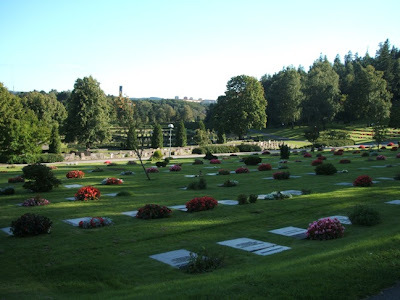 The funeral service took place at Vestre krematorium (crematorium), Oslo, on Wednesday 12 December 2001 at 1130. The death announcement in Aftenposten on Thursday 6 December 2001 No. 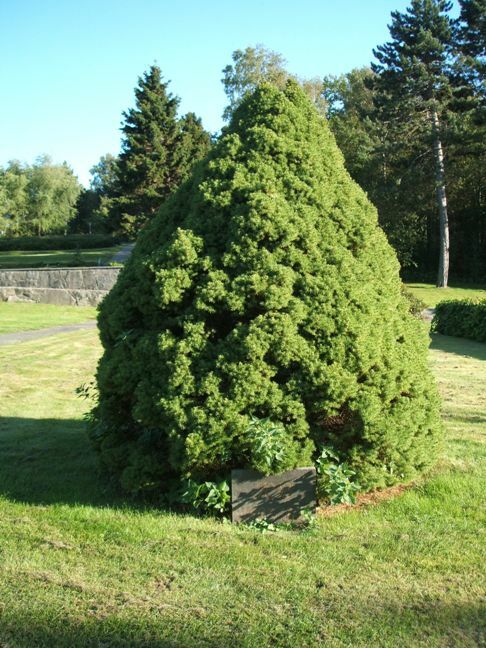 564, p. 13, was signed by her mother Bjørg, her full brother Eirik and sister-in-law Marianne and their children Isabella and Nicolas (Anne’s father had died in 1998). 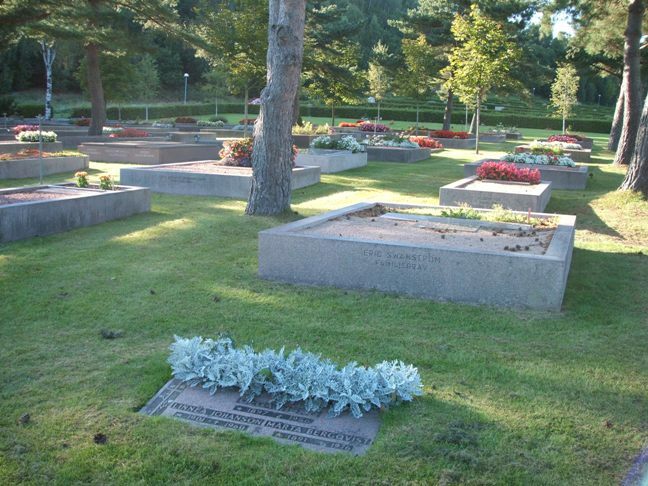 The urn was interred at Vestre gravlund (Western cemetery) in Oslo on 16 May 2002 (grave no. 20.059.09.11). Photo taken in June 2006. Grave no. 20.059.09.11. 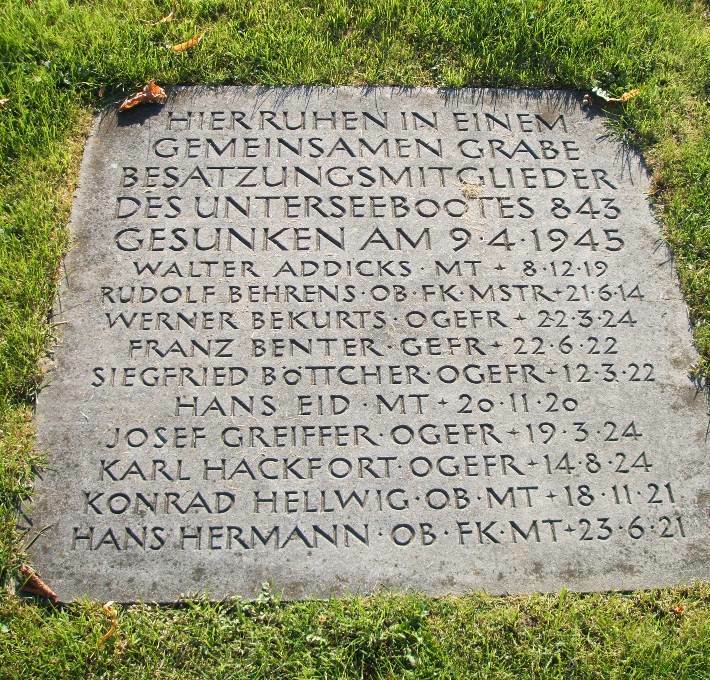 According to the genealogical work «Slekten Lütken i Norge», 1997, by Helen, Ferdinand and Frances Lütken (editorial committee), the Lütken family probably originates in the Bremen area in Germany. Johan Caspar Lütken, Anne's g-g-g-great-grandfather, was born in Hamburg on 19 April 1734 and died on 14 January 1798 at Østby gård (farm), Rakkestad, Smålenene (now county of Østfold). 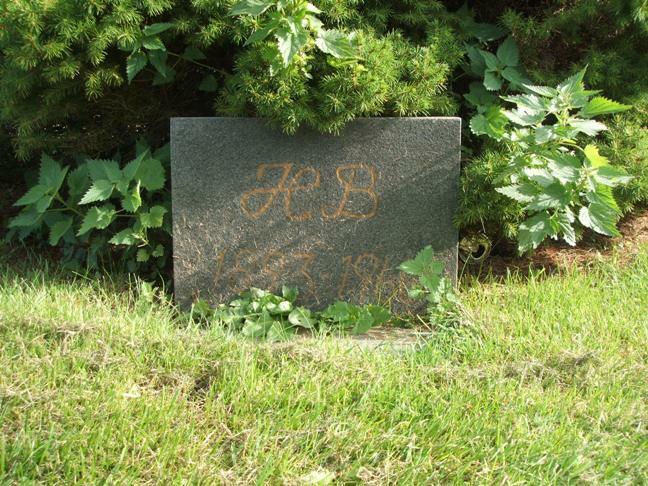 The names of his parents have not been established yet. He was married 3 times. His second wife was Daarthe Helene Paasche (1743-1781), daughter of Captain Christian Heidemarch Paasche, Rakkestad, by his wife Ellen Catharina Christensdatter Bjørnestad. They married in 1770. J.C.L. had 10 children, of which 8 with his 2nd wife. His 8th child was Lucas Johan Caspar Lütken, born at Østby, Rakkestad on 6 January 1778, d. at Rakkestad on 29 October 1850. He married 2ndly Randine Waarum (1786-1812), daughter of goldsmith Amund Waarum., and they had 3 children (Lucas got a fourth child with his 3rd wife; he was married four times). 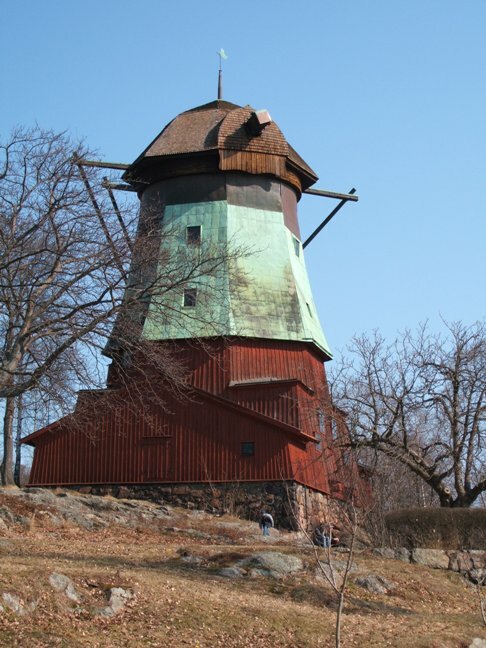 The youngest of the 3 was Randin Fredrik Lütken (1812-1902). 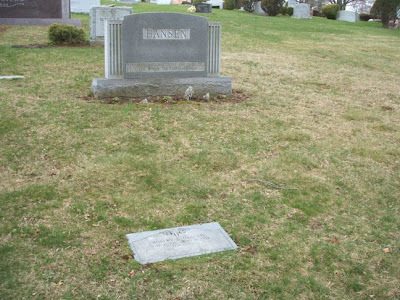 Randin Fredrik was married in 1839 to Caroline Marie Larsen (1824-1899), daughter of Iver Larsen and his wife Ellen Marie ---. They had 17 children, of which 12 sons! 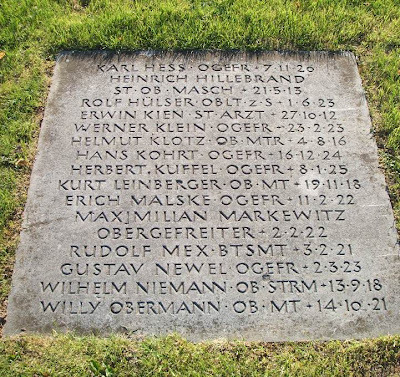 The 14th child was Georg Herman Nicolai Lütken (1861-1937). He was married to Klaudine Wilhelmine Engström (1873-? 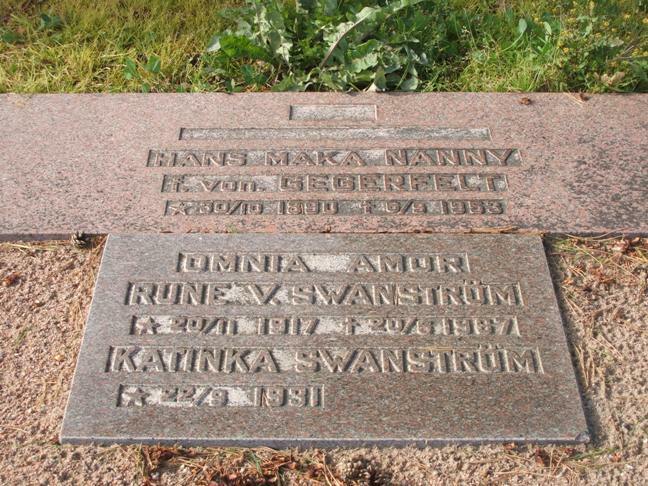 ), daughter of Otto Engström and his wife Mathea, in 1895 and they had 8 children. The fifth child was Karl Randin Lütken (1902-1981), m. Halldis Camilla Dahle (1907-1771), daughter of Oscar Dahle and Ottilie Olsen. 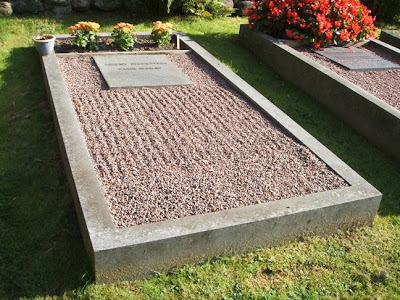 They had 3 children, among them Carl Fredrik Lütken, b. 1935. Carl Fredrik Lütken was first married to Bjørg Christiansen, and they had 2 children, Anne Michelle and Eirik. The marriage ended in divorce. His second marriage was to Kathe Kvaale and they had 2 children, Christin, b. 1979, and Christian Georg, b. 1983. 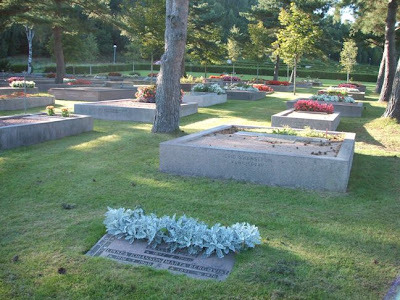 Carl Fredrik died on 12 June 1998 (cf. Disnorge.no/gravminner). (*) The sources I have collected don’t say whether Christian de Massy and Anne Lütken had both a civil and a religious wedding ceremony. But I know that the civil marriage took place at Ramatuelle on 11 September 1982 (Ramatuelle Marriage Certificate No. 16/1982). (**) In VG’s article 4 July 1999, based on an interview with Anne Lütken, the divorce year is stated as 1987, as I wrote in my original article. However, according to the said marriage certificate, the divorce was granted at Monaco on 13 June 1985. Nobiliana.de. Information about the marriage certificate no. 16/1982 posted by Emilien on 24 June 2006. Updated on Wednesday 26 December 2011 at 10.50 (missing word inserted). 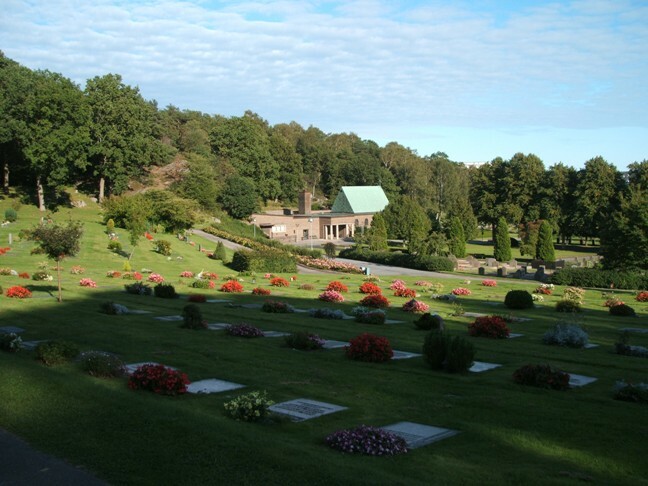 See part I for an introduction to the Kviberg Cemetery. Most commentators seem to believe Dagbladet's story that the king had wanted to take part in the ceremonies, but was talked into accepting the so-called "division of labour". 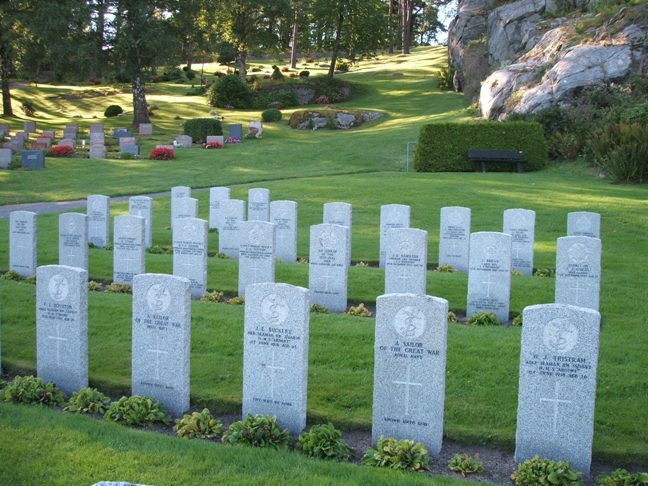 See Views and News from Norway's article Stoltenberg admits to medal error dated 11 May 2011. Section 3. 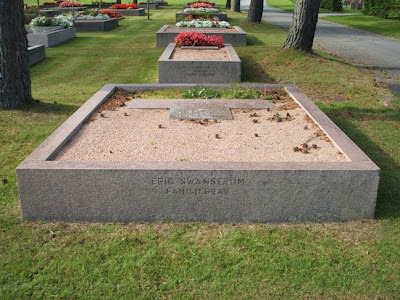 Grave of Queen Sonja's former brother-in-law Rune V. Swanström (1917-1967) and his mother Nanny, née von Gegerfelt (1890-1953). See my blog article From von Gegerfelt to Shetelig, of 30 September 2010, for more details. Section 2A. 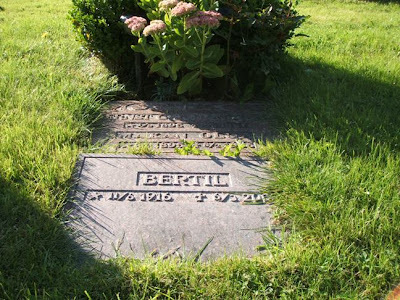 Grave of Harald Bernhard Bengtsson (1893-1966), nicknamed "Bildsköne Bengtsson", the infamous master burglar. 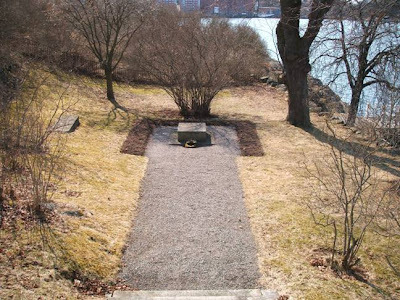 See Bildsköne Bengtssons Minnesförening (Bildsköne Bengtsson's Memorial Associaton) for more details (in Swedish). "Bildskön" is not too easy to translate - "photogenic", perhaps? Section 53B. Grave of Erik Bertil Swanström (1916-2003), who I believe was related to the above-mentioned Rune Valdemar Swanström. Section 26. 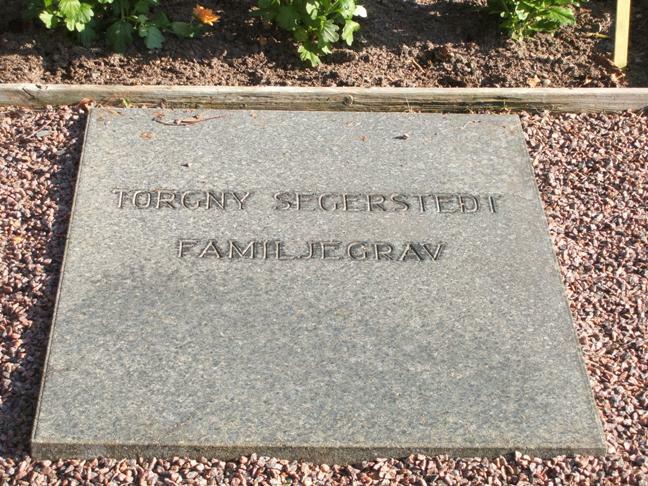 The Segerstedt Family grave, which includes the last resting place of Torgny Segerstedt (1876-1945), publicist and editor-in-chief of Göteborgs Handels- och Sjöfartstidning, known for his uncompromising anti-Nazi stance and thus a good friend of Norway - he was also married to a Norwegian woman, Augusta Wilhelmina Synnestvedt (see the Norwegian Genealogical Society's periodical Genealogen No. 1/2011, pp. 12-26 for an article about the Synnestvedt family). 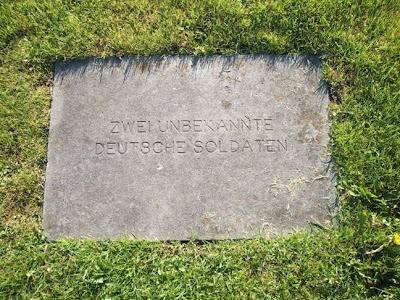 The German War Graves section. 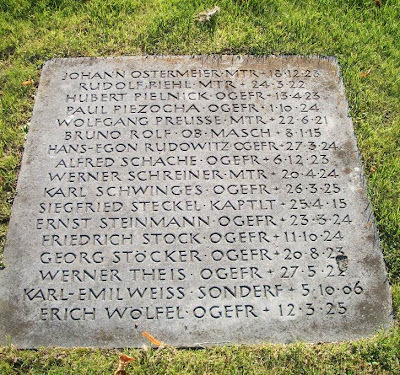 Casualties from the submarine U 843. 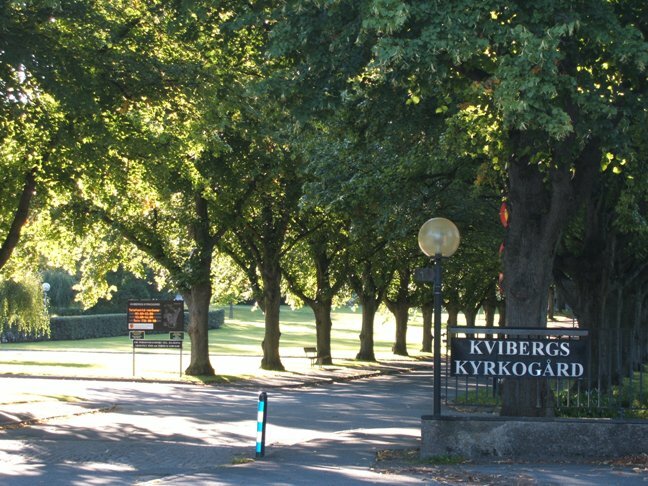 According to the website of Kyrkogårdsförvaltningen i Göteborg (the Gothenburg Cemeteries Administration), Kvibergs kyrkogård (Kviberg cemetery) is the largest cemetery in Sweden and also the second largest in Northern Europe. I wonder which cemetery tops the list then. Ohlsdorf in Hamburg perhaps? Anyway, Kviberg cemetery was consecrated in 1935 and is measured to 130 hectares (about 320 acres). 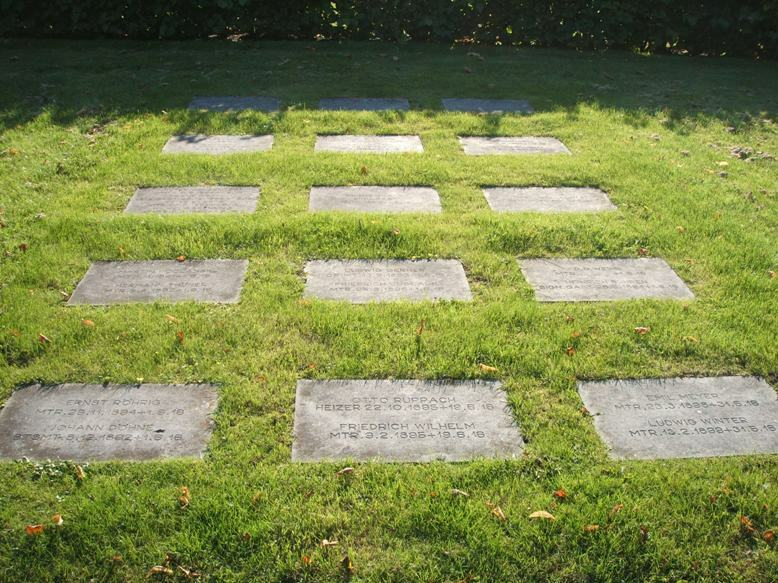 The cemetery has 24 167 graves, but I am not sure when the website was last updated. 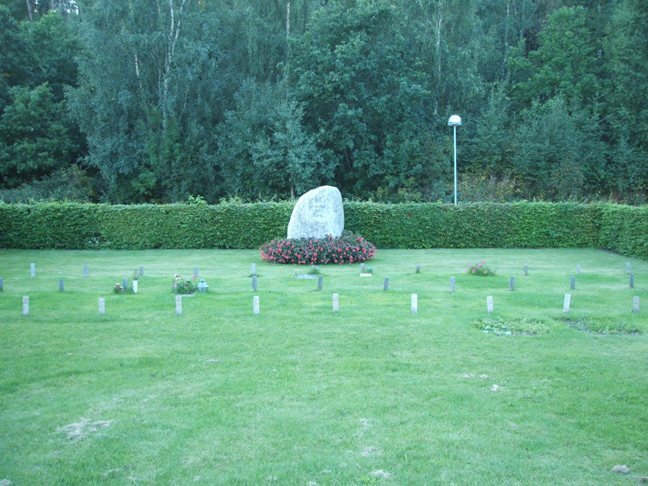 In the early 20th century Gotenburg's first airport was situated where the cemetery is now. 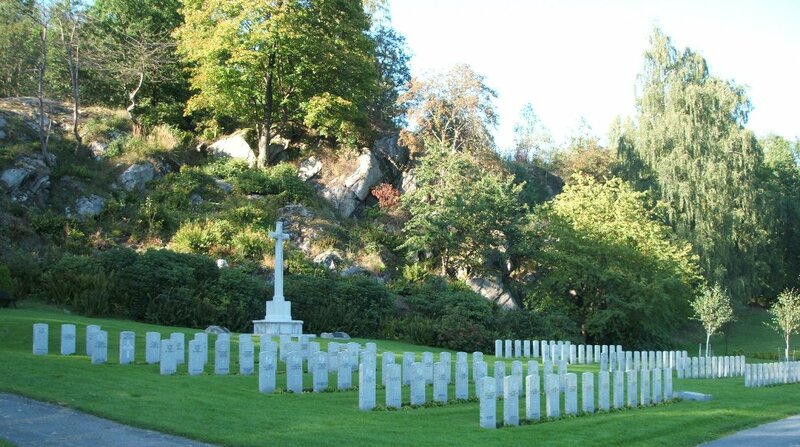 The cemetery has among others two sections of war graves from bnoth WW1 and WW2. One is administered by the Commonwealth War Graves Commission and the other by the Volksbund Deutsche Kriegsgräbefürsorge. 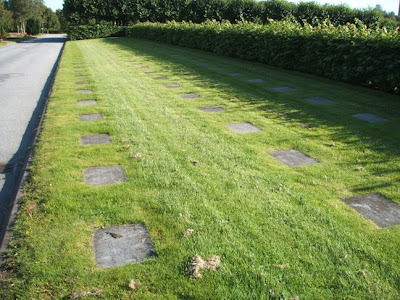 The former contains 68 burials of WW1, many of them naval casualties from the Battle of Jutland in 1916, as well as 46 from WW2, most of them airmen who failed to return from bombing raids over Germany or German occupied territories. 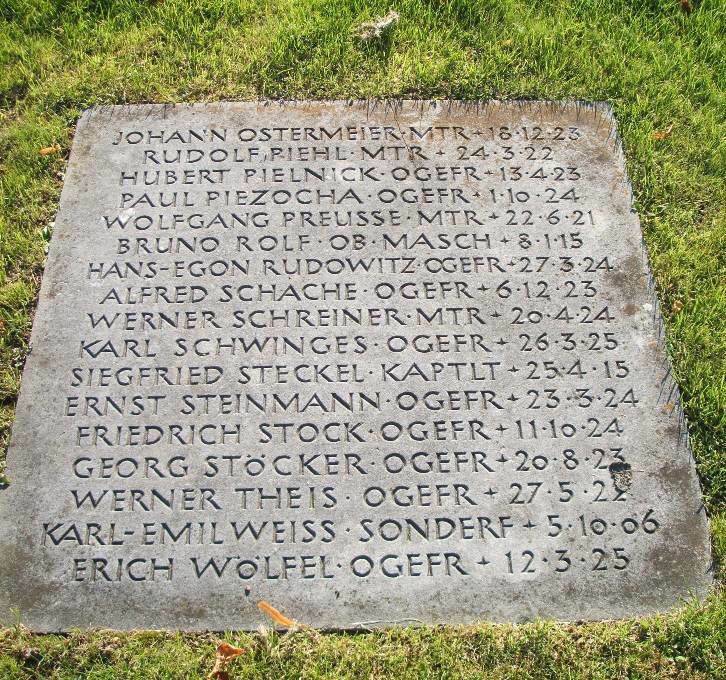 The German war graves section includes 96 casualties from WW1 and 281 from WW2, including victims from the submarine U 843, which was sunk in April 1945. See also my blog article Fjällbacka Church and Cemetery, Tanum, Sweden, of 11 July 2010. 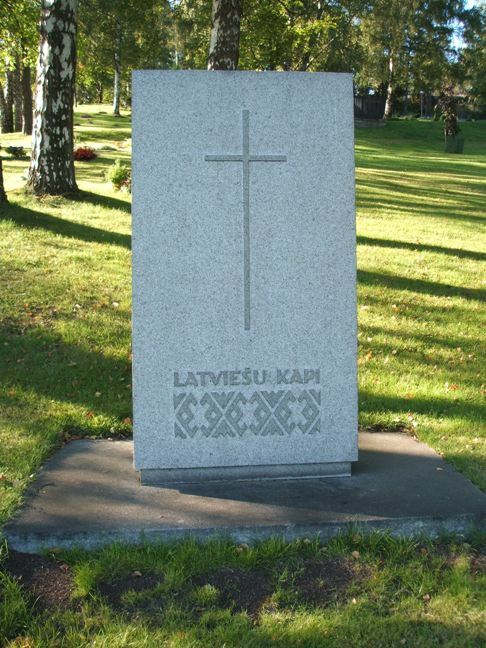 In addition there are sections for among others persons of (former) Latvian nationality as well as Swedish seamen. Kviberg Cemetery is located at Kortedalavägen (near the junction of Regementsgatan) in Gamlestaden in Gothenburg, and can easily be reached by tram from downtown. See the map provided by Eniro. The photos were all taken in August 2008. The quote stems from a short comment the king gave to the press during the state visit to Slovenia today. The king has decided to be loyal to the government's version - anything else would have not have been a very wise move. While the prime minister has categorically denied snubbing the king - what else could he have said - the opposition as well as the media have had a field day. One should of course have in mind that it is the tabloid Dagbladet who has made today's headlines, but regardless of this I find it really difficult to believe that the king voluntarily should have let his position be undermined this way. Handing over military decorations is the king's arena, as have been commented on by politicians and others today. The government's lack of judgment is evident. Hopefully it will come to a more sensible conclusion - to include the king, that is - next time around. See also my blog article Veterans' Day without King Harald published earlier today. The 8th of May is called «Frigjøringsdagen» («Liberation Day») in Norway and is an official flag-flying day, commemorating the day when Norway was liberated from German occupation in 1945. 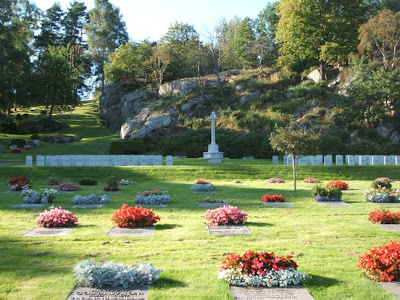 Last week the Norwegian Government decided to make the Liberation Day also a «Veterans’ Day» in recognition of the veterans’ contributions and war efforts from WW2 on. The intention is to commemorate the 8th of May also as a Veterans Day’ every year from now on. 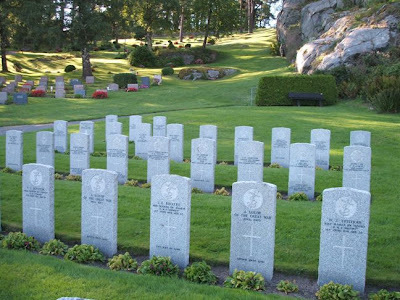 On 8th of May this year there were arrangements several places in Norway where members of the Norwegian Government took part. 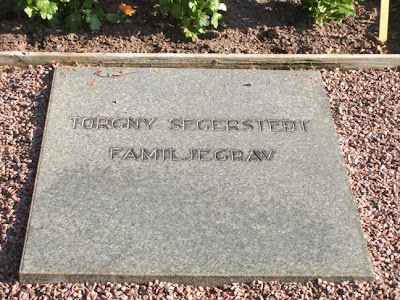 Prime Minister Jens Stoltenberg and Minister of Defence Grete Faremo – the former’s grandfather, the officer Emil Stoltenberg, spent 2 years as a prisoner of war in among others Poland during WW2, while the latter’s father Osmund Faremo (1921–1999) was active in the Norwegian resistance movement Milorg and spent nearly 2 years in concentration camps in Germany and Austria as a «Nacht und Nebel» prisoner. Minister of Government Administration, Reform and Church Affairs, Rigmor Aasrud attended commemorative events at Hamar, Elverum and Rena, Minister of Petroleum and Energy Ola Borthen Moe was in Trondheim, Minister of Transport and Communications Magnhild Meltveit Kleppa was in Stavanger and Minister of Research and Higher Education Tora Aasland in Kirkenes. In addition 3 state secretaries – Terje Moland Pedersen, Hans Kr. Amundsen and Roger Ingebrigtsen – attended events in Fredrikstad, Bardufoss/Heggelia and Tromsø. In Oslo the Veterans’ Day was marked at Akershus Castle and Fortress with speeeches, laying of wreaths, a reception, a twirling display by His Majesty The King’s Guard and a medal ceremony as well as a church ceremony in Oslo domkirke (Oslo Cathedral). Three Norwegian officers – Colonel Eirik Johan Kristoffersen, Captain Jørg Lian and Naval Commander Trond André Bolle (for the latter the award was made posthumously, as he was killed by a roadside bomb in Afghanistan last year) – who have served in Afghanistan received the War Cross with sword. The Chief of Defence of Norway, General Harald Sunde, presented the decorations, assisted by Prime Minister Stoltenberg. I missed the King’s presence at Akershus and wondered about the reason for his absence. 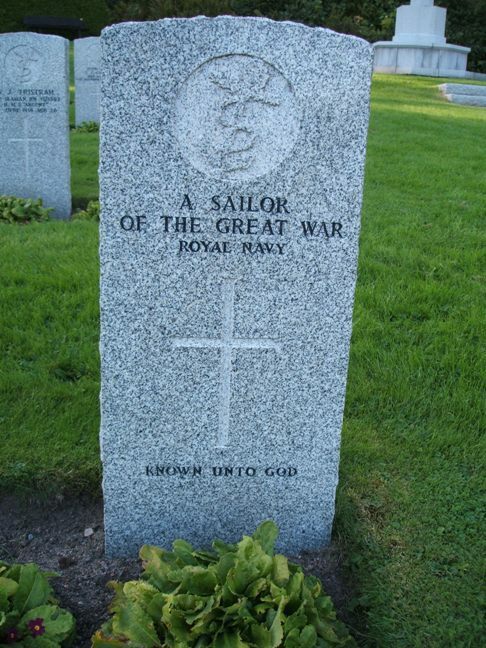 He had no official engagements that day, and even if decisions on the War Cross are taken by the King in Council (i.e. the Government, with the king presiding over the Council of State) and not the King personally, if would be natural that he was present. He is known to care a lot about Veterans issues and takes his constitutional obligations as Commander-in-Chief seriously. Dagbladet today claims to know, citing among others several unnamed sources in the Armed Forces, that King Harald had wanted to be present at Akershus and to hand over the decorations himself, but was denied this by the Prime Minister. The court’s communications secretary Marianne Hagen has told Dagbladet that «the War Cross was this year presented by the Chief of Defence on the King’s behalf. This is something the king and the prime minister have agreed on». She refused to comment when Dagbladet asked if it was not natural for the king to be present under such a ceremony. 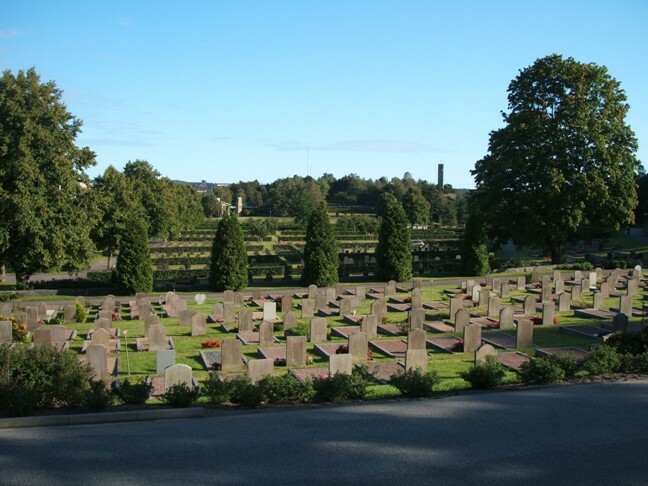 See also photos and press releases at Regjeringen.no (the Government's official website), Flickr and Forsvaret.no (the Armed Forces' website) as well as Views and News from Norway's article (9 May 2011), Liberation Day now Veterans' Day. Updated on Tuesday 10 May 2011 at 16.15 (one expression changed). Grave of Prince Eugen of Sweden (1865-1947). I visited Waldemarsudde, the home of the artist Prince Eugen of Sweden, during my first (and still only) visit to Stockholm in early April 2006. It became one of the highligts of my visit, not only because the museum and gallery were interesting and enjoyable to visit, but also because the weather that day was sunny and warm. 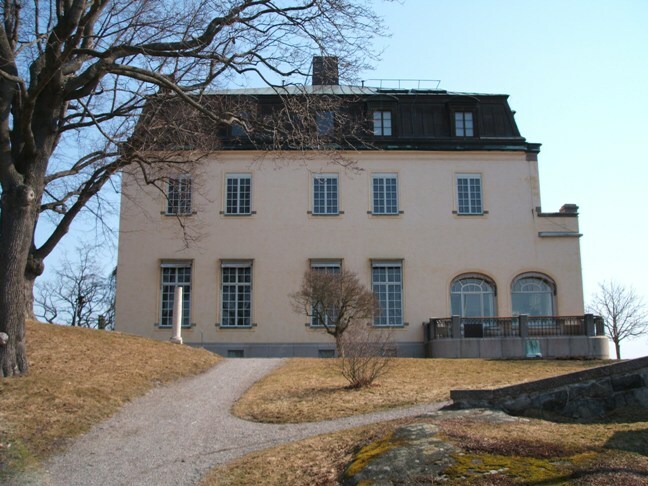 Prince Eugen, the youngest son of King Oscar II and Queen Sophia, bought the property in October 1899 and the mansion was finished in 1905. After his death in 1947 the estate became - in accordance with Prince Eugen's will - the property of the state, and is today one of the most popular arts collections in Sweden. 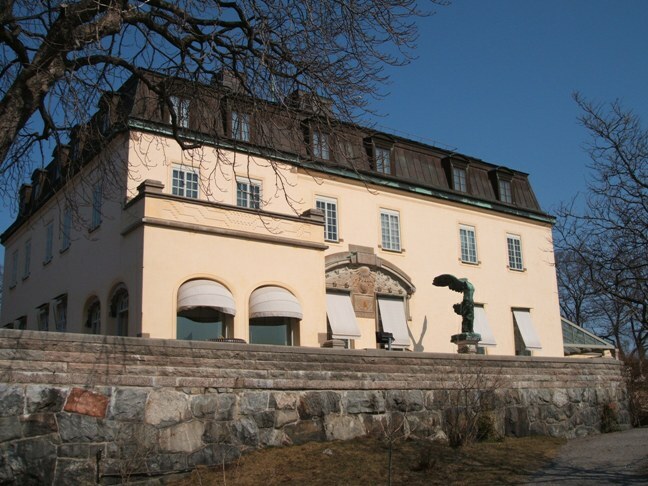 Go to the website for more pictures and details about the estate and museum! Besides the mansion and the gallery, the park is also worth taking a walk in. 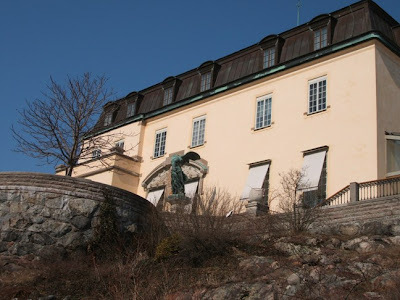 Waldemarsudde at Djurgården has the address Prince Eugens väg 6 (of course!) and can be reached by tram (S7 from Sergels torg) or by ferry to Gröna Lund. Updated on Saturday 21 May 2011 at 13.00 (typo corrected).